Joseph Mallord William Turner entered the schools of the Royal Academy in 1789 when he was only fourteen. One year later he was admitted to the Royal Academy itself as an associate member. He exhibited a watercolour in 1790 and his first oil painting followed in 1796, "The Fishermen at Sea". From then on he exhibited at the Royal Academy for the rest of his life. He travelled in France, Switzerland and other European countries and studied the paintings in The Louvre in 1802 and during the same year he became a full member of the Royal Academy. In Venice he often studied the sea. Allthough he was succesful during his entire career his work was much criticised. In 1843 John Ruskin wrote a powerful defense of Turner's paintings. Turner never married, but he had two children with Sarah Danby, born in 1801 and 1811. His father lived with him for thirty years and after his death 1829 Turner suffered from depressions. He last exhibited in 1850 and in 1851 he disappeared from his house. His housekeeper looked for him for months and finally found him at the house of Sophia Caroline Booth, his mistress. He died there soon afterwards. Much of his work can now be seen at the Clore Gallery in London. 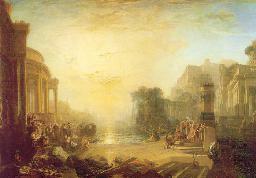 5/6/1894 Turner's "Ancient Italy" bought for the Louvre. The cost was 8.000 pounds. 13/6/1896 Julian Goldsmith's paintings are sold for 67,342 pounds. Among them were works by Turner and Reynolds. 6/5/1899 John Fowler's paintings are sold for 65,335 pounds.. Fowker had died. A landscape by Hobbema was sold for 9,100 guineas and "View of Venice" by Turner fetched 8,200 guineas. 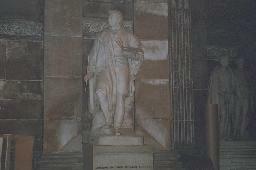 Grave monument for J.M.W. Turner at St. Paul's Cathedral, London. 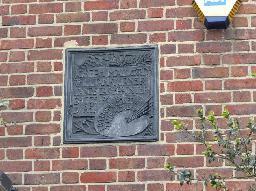 Plaque for J.M.W. Turner at Cheyne Walk, London. "The Decline of the Carthaginian Empire".